This is the simplest method of hydroponics and is used mainly by growers who only wish to cultivate a minimal number of plants or for the propagation of small plants. It is a true domestic incarnation of hydroculture. The system consists of a bucket with a lid, large net pot, clay pebbles, large air pump, airline, and a large round air stone. The air stone is placed at the bottom of the bucket with the airline running to the air pump on the outside of the bucket. The bucket is filled to approximately two thirds to three quarters full with water. The lid is placed on top of the bucket which holds a net pot, which in turn holds the clay pebble growing medium. 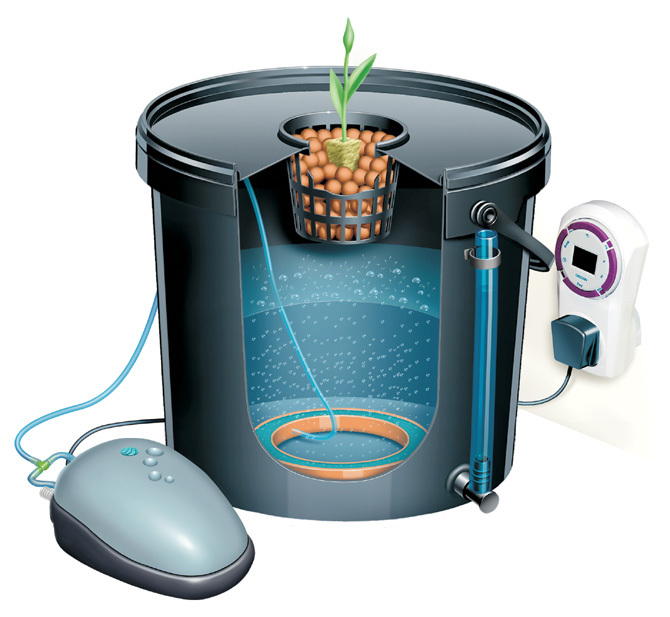 The system relies upon an air pump and an air stone to bubble air through the nutrient solution to mix it, but also in the beginning to generate spray, so as to get the clay pebble medium wet in order to establish the roots through the net pot. Consequently, the water has to be high enough to saturate the clay pebble medium by means of getting it wet or even moist via the actions of the bursting air bubbles. Once the plant has established a good root system, then it is advisable to lower the level of water in the bucket so that some of the roots can be allowed to hang in the air between the net pot and the water level. The majority of the roots live in the aerated deep water, 24 hours a day. With 24 hours a day in mind, as the roots are constantly submerged, it is crucial that the air pump is on 24 hours a day. If the pump is allowed to be off for any length of time, the roots will suffer from being waterlogged and starved of oxygen. constant flux and therefore in need of constant attention. Not only that, but larger plants can deplete 5 litres of water in a single day so you are also in constant danger of the system literally running out of water. To emphasise this a little better, as plants uptake water they do not necessarily uptake nutrients at the same rate and as this occurs, the plants might be drinking lots of water but not eating much food. The result is that in a matter of hours, as the water is depleted, the concentration of the nutrients in the bucket can reach toxic levels. So it is critical to always under feed your plants in this system. chamber. To lift the lid with a small plant in it is not so much a worry, but to be constantly lifting the lid with a large plant located in it will do damage to the plant and the rootball of the plant. Bear in mind that you will have to do this on at least a daily basis, so the practicality of this technique is very questionable. If you were to maintain several of these buckets in one grow room, then you could be looking at a full-time maintenance job; ­ not really what hydroponics is about! Large plants that are grown in this system will also need extra support due to the fact that the plant is grown in a minimal amount of medium, which will not support heavy yielders. As this system¹s engine is an air pump and an air stone, then the bigger the air pump and the bigger the air stone, the better this system will perform.